One year after heat records smashed cold records by a ratio of over 35 to 1, preliminary data from the National Climatic Data Center (NCDC) show that new daily low temperature records in the U.S. outnumbered high temperature records by 6.5 to 1 in April. 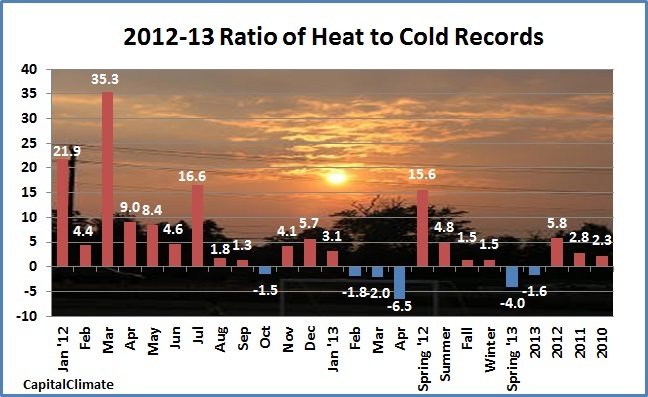 This was the largest monthly excess of cold records so far this decade. It was also the first time since at least February 2010 that more than 2 consecutive months have had more cold records than heat records. 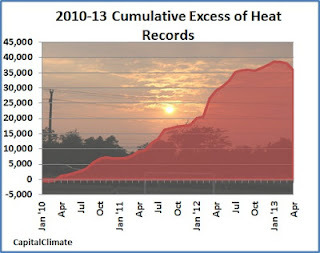 For the spring season to date (March-April), cold records have exceeded heat records by a ratio of 4 to 1, and for 2013 to date, the ratio is 1.6 to 1. On the other hand, for the 12 consecutive months ending in April, heat records continue to outpace cold records by a ratio of 1.8 to 1. Cumulatively, the ratio of heat records to cold records is 2.8 to 1 since January 2010, well above the roughly 2 to 1 in previous decades. As the chart shows, the 2600 cold records in April barely made a dent in the cumulative excess of 36000 heat records since the beginning of the decade. Preliminary data from NOAA/ESRL show that the coldest temperatures relative to average were in the North Central portion of the U.S. in April. The Pacific Coast states, however, were warmer than average, and near to above average temperatures prevailed over most of the eastern third of the country.